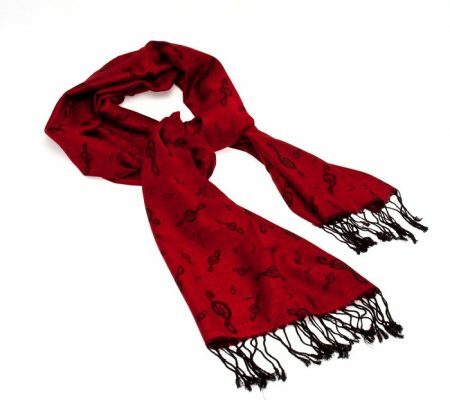 Treble Clef Red Pashmina Scarf – Stay warm while showing your sense of style with this stunning pashmina scarf! Sewn with a black and red motif in mind, this would be the perfect music gift for the fashion forward musician. You can wear this scarf for a night out on the town, or just out to run a few errands. You’ll be looking chic and modern wherever you go! Made of a pashmina wool blend. Size: 72″ x 27″. Hand wash/ Dry clean only.